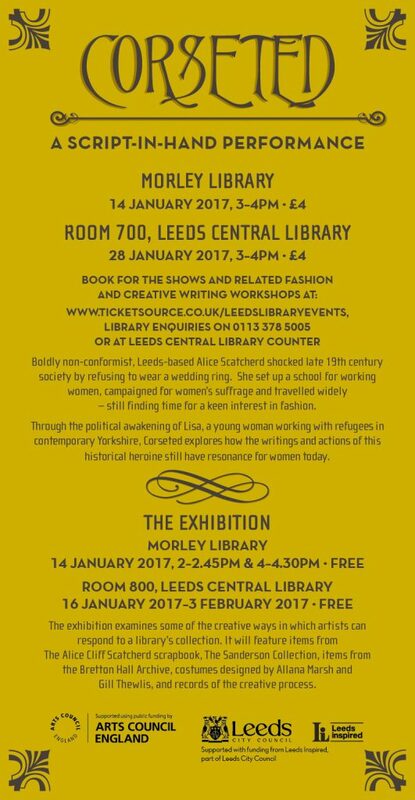 We were awarded a Grants For The Arts grant by the Arts Council and by Leeds Inspired to research and develop a one act show inspired by historical Morley figure Alice Cliff Scatcherd. The project was originally called Alice In Bloomers and was researched with the help of the Morley community and local academics including Vine Pemberton Joss. Period costumier Allana Marsh and contemporary clothes designer Gill Thewlis worked alongside me to produce costumes in response to the Alice Cliff Scatcherd scrapbook and the script. 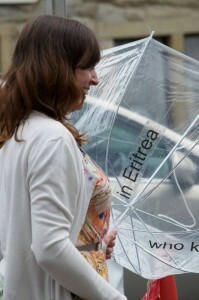 The project was supported by Morley Library and Leeds Central Library and links closely with their collections. Additional costumes for the exhibition were loaned by Stage@Leeds archive. Script-in-hand readings and exhibitions were held in January 2016 alongside creative workshops. The performance was directed by Ray Brown and performed by Becky, Biddy Coghill and Derek Holt. 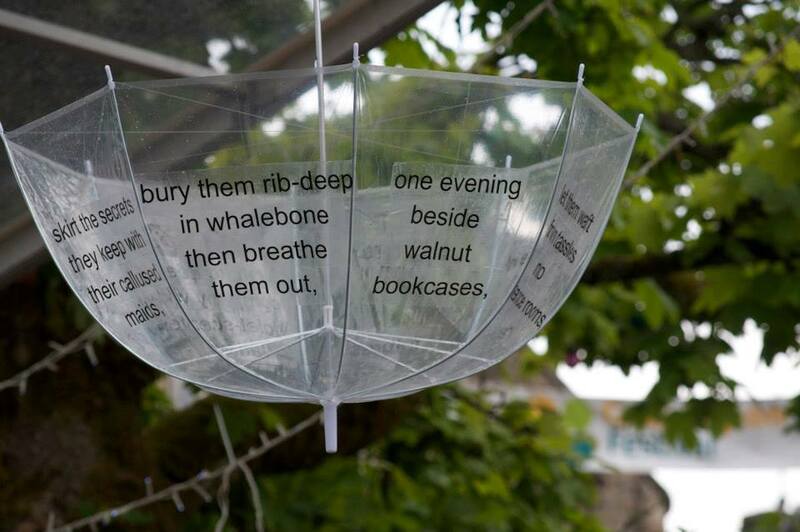 As part of her role as Beam’s lead artist for Altofts Festival In A Day, Becky was asked to write bespoke poems for a trail of the village, which took place on 24th September 2016. Over the summer, she spoke to people from the community and listened carefully before crafting poems from their words and from Altofts’ history. A recording of the poems and PDF with accompanying map are available to download for anyone who wants to follow the trail and discover the treasures of Altofts. This commission was made possible thanks to Arts Council England Strategic Touring funding as part of the Lit Fest in a Day programme delivered by Beam in association with the Friends of Altofts Library group, with the aim to engage a wider, more diverse audience with reading and writing that is relevant to them and their place. To inhabit, visit, or appear to in the form of a ghost. To haunt one’s thoughts or memory. Hometowns like old diaries have this knack of calling you back to mark the milestones of your mistakes. This is not the Harrogate of everyone. 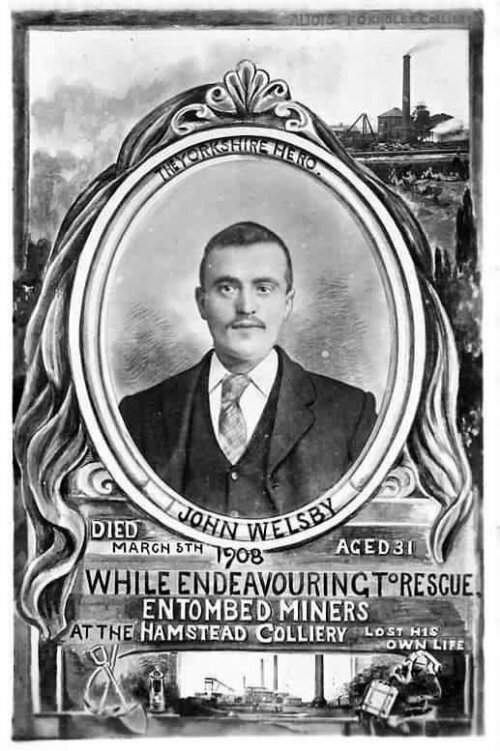 For some people this idealised history is a haunting presence in their lives, in the fabric of buildings where they live in one room, or the parks where they sleep. Their experiences are muffled beneath the dominant voice of Harrogate. Haunt explores how people who are homeless, or bedsit residents, live inside these ghosts of the town’s past. Haunt gives people a place to tell stories not normally heard in the accepted narrative of the town and bring them to a wider audience. An Imove project with fiction writer Steve Toase that sprang from his experiences and grew into a book Haunt and site-specific theatre piece of the same name. The first incarnation of the show was the result of a collaboration between workshop participants and artists Steve Toase, Tessa Gordziejko, Stef Jones, Zoe Parker, Al Orange, Tom Hunt, Rory Gordziejko and Becky. 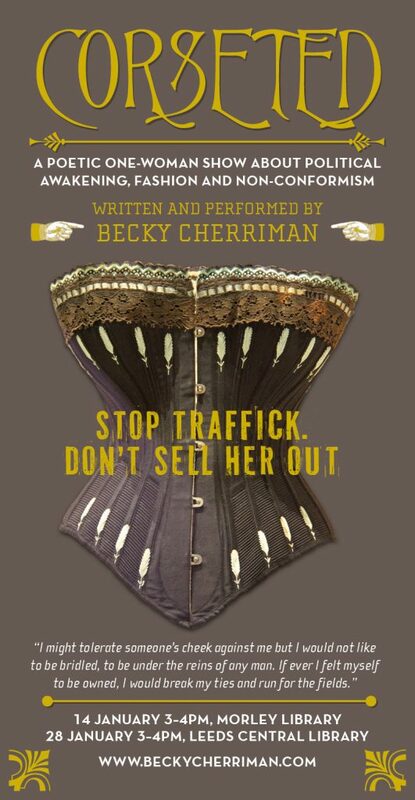 It took place in Harrogate in the summer of 2015 and incorporates material from Becky’s yet-to-be-published first novel. 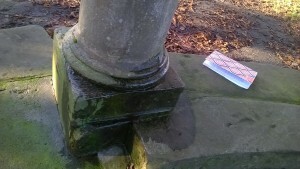 Read work produced on the project and find out more about how the project is developing at Haunt. N.B. Homelessness and vulnerable housing are problems that many people have dealt with during their lifetime. Becky shares her own experience of being vulnerably housed in the Haunt blog. The umbrella kenning finds new life in Holly’s visual interpretation here, first published in the Grassington Festival newsletter. For more on Holly’s work go to http://spence-creative.com. ‘Daisy Hill’, ‘Queen Street’, ‘in bloom’, and ‘cow’ all found their way into the commissioned poem below. But it wasn’t just these words and phrases that influenced its conception. 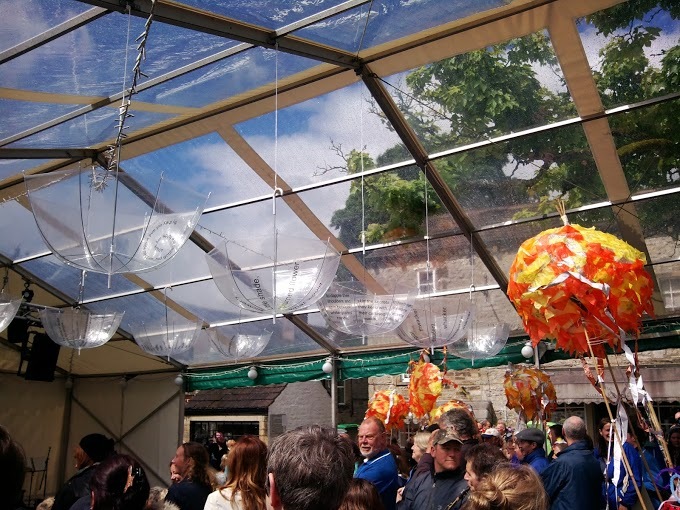 Some of the other words collected by the festival team contained recurring motifs – the kindness and genuineness of the people; the beautiful historic buildings; Morley’s hills; words connected with family, with the ‘close knit’ community, with motherhood, courting and love. It was, however, the submitted phrase ‘I’ll find a way back to then’ that echoed its refrain around my mind in the approach to the festival and gave me a starting point. I wanted the theme of the poem to be guided by the words submitted and so put out a request for those dropping their phrases into the poetry buckets at Morley Library and The White Rose Centre for ‘a few words about a person, place, object or memory that you value’. In addition people were asked what they thought about Morley. Hence the wide-range of responses. There are different approaches to the crowdsourced poem. On the University of Northern Georgia website, visitors are given one line and asked to submit another line or a sestina. The poet selects one of these and requests the next line, giving only the last word of that line. For Dan Simpson, every word is sourced from submissions and so the piece truly becomes the poem of the crowd, a kind of poetic anagram. Although the scope of my poem (and the research involved) was on a much smaller scale, my approach was similar to that of Alice Oswald when researching her narrative poem about the river Dart which she described as ‘a kind of jazz written by the whole Dart community’. Like her, I felt it was important to put my own stamp on the poem whilst prioritizing people’s stories and research into the locality I was exploring. During my early ventures into Morley, I discovered Morley Hall, a building commissioned by a 17th century mill owner and owned by various people including Joseph Priestley, the namesake nephew of the man who discovered oxygen. 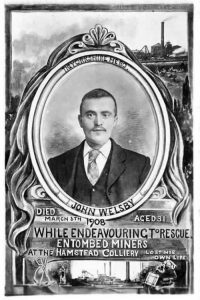 Looking into the history of this ‘beautiful building’, I developed an interest in one particular ex-inhabitant Alice Scatcherd, a suffragette who dined with weavers and miners and fought for working men’s rights. She taught two hundred children on the grass outside her house, caused a scandal when travelling around Europe by refusing to wear a wedding ring, was the first woman to wear an elasticated waist and the only Victorian woman to lay a foundation stone. Alice also campaigned for prostitutes to be able to keep custody of their children which makes it quite apt that, after the hall was given in perpetuity to the people of Morley by Charles Scarth in 1917, it became a maternity hospital (until it was sold to a private buyer in the 1970s by Leeds City Council). I wanted my narrator to try to ‘find a way back to’ the period when Morley’s babies were born at the hall and, in trying to conjure up the place’s past who better to learn from than Morley Hall baby Jill Hepworth the local librarian. On her recommendation, I also spoke to Mary Sykes who used to be a nurse there and whom I feel embodies the generosity of Morley people. Some of expressions used in the poem are taken directly from her and I am very grateful for the stories she told me. when the snap of rhubarb resonated in rusted iron drums. where you laboured on fissured ground. past a ripped-off linnet’s wing. kept on, abandoned pleasure gardens in bloom. the people round here, they walk with you. 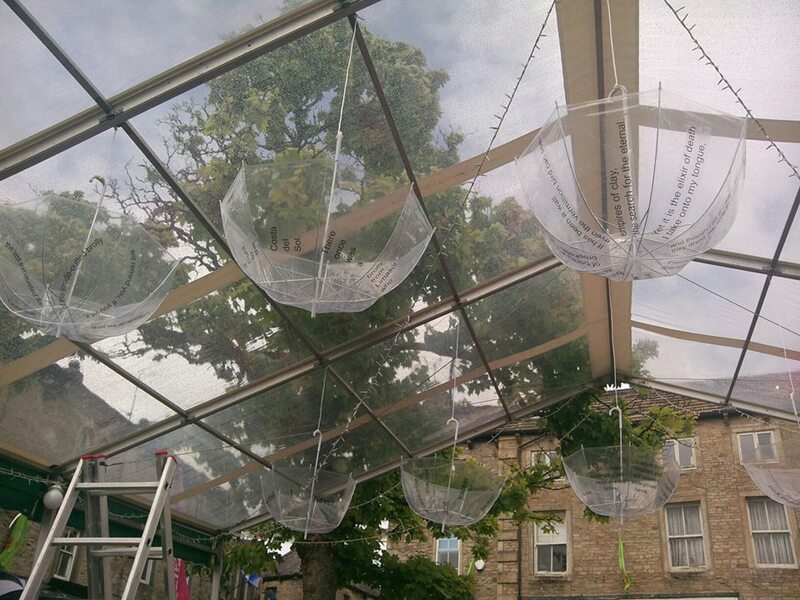 ‘The commission was for Becky to produce texts to be displayed on umbrellas which were to be hung in Grassington Market Square for the duration of the festival. The idea was conceived by Bryony Pritchard, Visual Arts Director of Grassington Festival. Bryony: 10 brollies. 10 poems. 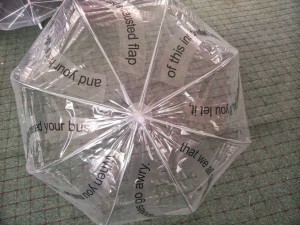 How did you find creating so many poems about brollies for the festival? Becky: I thought it was going to be tough. ‘What can you say about brollies?’ I thought initially. Yet I discovered that there is so much history and mythology around umbrellas that I fell in love with the subject and could easily have come up with ten more. Bryony: What interesting facts did you unearth in your research? Any surprises? Becky: So many surprises! I found out that umbrellas had been used as a weapon against villains in Victorian England, that they are one of eight holy symbols in Buddhism and that in some areas of Eritrea annual rainfall is substantial. The first emperor of China saw the umbrella as important enough to protect the terracotta chariots that accompanied him to the grave. It seems that even in heaven it rains! 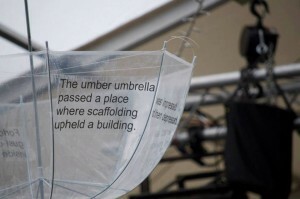 I was also pointed to a fantastic twitter site that retweets tweets about broken umbrellas. Some of the pieces were inspired by images and tweets found there. Bryony: What were the challenges? Anything learnt? Becky: We felt that we wanted most of the text to be big and bold so the key challenge was to produce very short pieces. 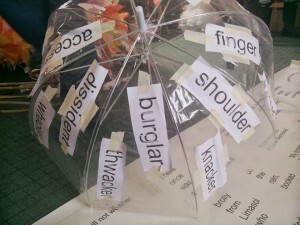 I learnt a lot about umbrellas! 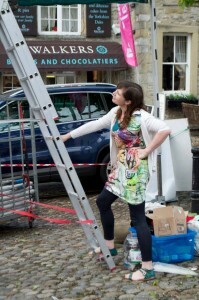 Bryony: Site specific- Creating poetry for the outdoors installation – what was that like? Becky: The site impacted significantly on the content of the pieces. 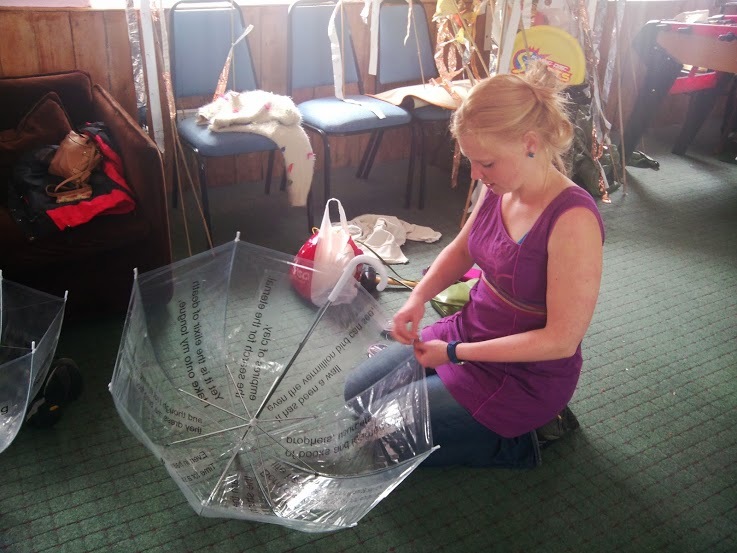 I wanted experiencing the brollies to be a fun experience for festival-goers and wanted each one to offer something different so I chose to write about a range of umbrella-related subjects in a variety of forms and tones. I knew they were going to be seen by a varied audience and wanted to offer something to families as well as poetry aficionados. So, swinging from the marquee, you will see flash fiction, free verse, a limerick, a kenning and more. I had been writing with the umbrellas in mind but, placing the words on the brollies, made us find another dimension to them (literally). We discovered with some of the pieces that you could read them in several ways, for example by starting at different points. 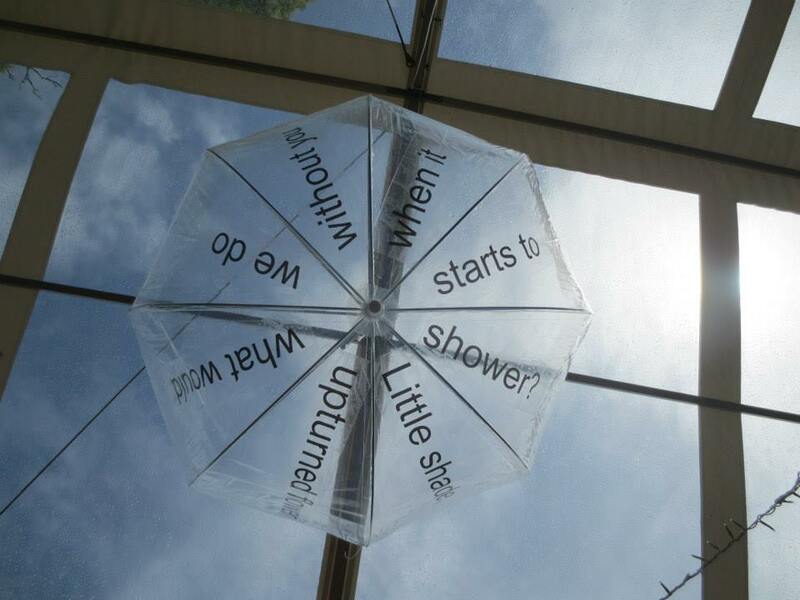 Sometimes, because the presentation was non-linear and because of limitations of the panels of the umbrella, the form needed to shift and pieces had to be altered. It was a very interesting process. I am the first, the shining unnameable. and learned men, prophets, usurpers. empires of clay, the search for the eternal. they dress me, bring food I cannot eat. Time for a shade that will not weather. When you must be there on time and you’ve missed your bus and your hair is fluffed with rain, the last exhausted flap of this inside-outted brolly will remind you, if you let it, that we all have days when our spokes go awry. Never ever pick up a dropped umbrella. when it starts to shower? The umber umbrella passed a place where scaffolding upheld a building. It was impressed and then depressed. ‘My bones are metal too’ it said ‘and all I hold up is nylon.’ Forlorn, it allowed a gust of wind to turn it inside out. Thanks to Anna for the photographs, to the tech team and volunteers for re-inforcing the umbrellas and hanging them from such dangerous heights, to Sad Broken Brolly and contributors and to Grassington Festival and Bryony for all they did to make this happen. 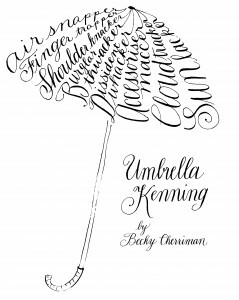 The umbrellas were popular with festival-goers and poets who described them as word chandeliers and requested them for everything from weddings to everyday use. Read about them here. 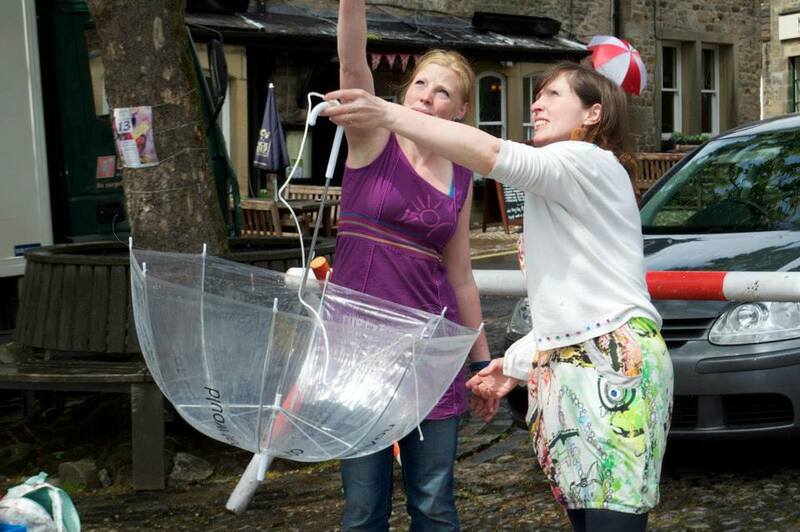 The umbrella kenning finds new life in Holly’s visual interpretation here, first published in the Grassington Festival newsletter. 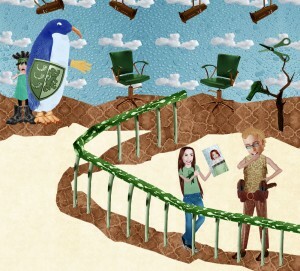 For more on Holly’s work go to http://spence-creative.com. Becky always relishes the challenge of a commission. 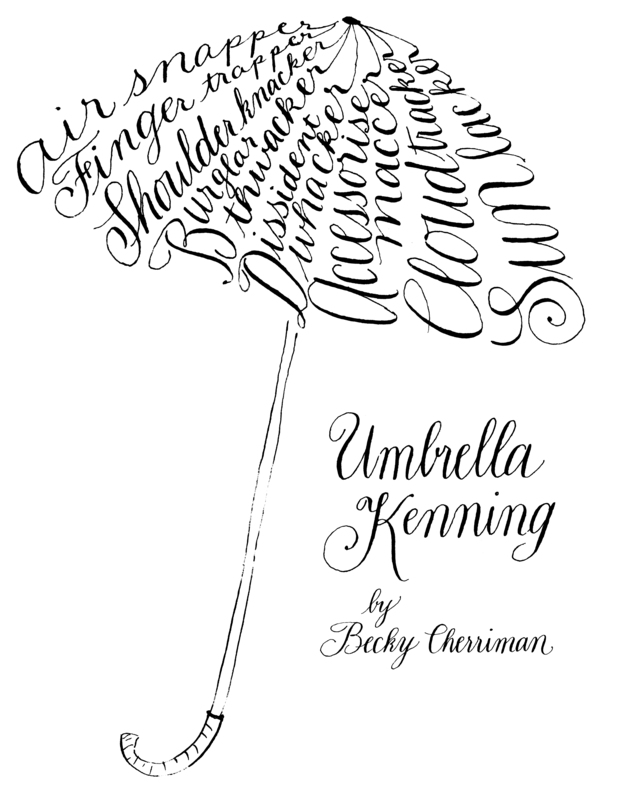 Email her on write@beckycherriman.com if you’d like to discuss a potential commission.